If you were not aware before, I wear glasses the majority of the time. I'm not only nearsighted ( I can't see things from far away) but I also have a little bit of astigmatism. Fortunately, I don't have to use contacts for astigmatism, unfortunately, I've always had different prescriptions powers in each eye. You know what that means, EXPENSIVE VISION! I had terrible vision insurance before so I was searching for an alternative way to pay for my glasses and contact exam + contacts. After seeing a lot of ads for Sightbox, I figured I'd give it a try. 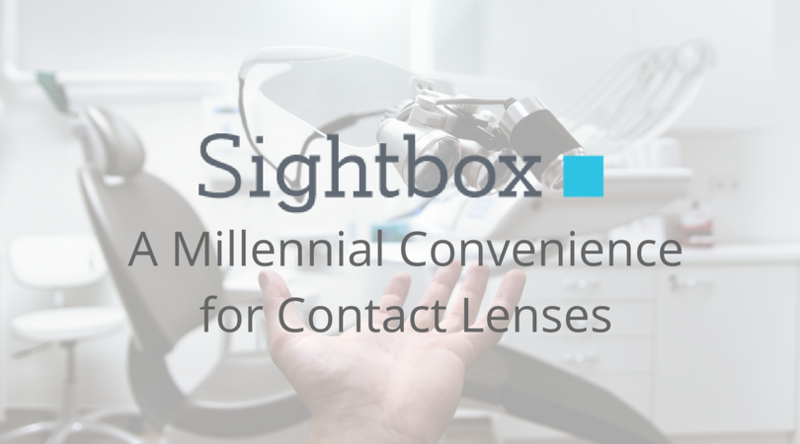 If you don't know what Sightbox is, they say they are "Your Contact Lens Concierge". Really, they are! All you do is sign-up and pay $39 a month. Think of it as subscription box company like Birchbox, Julep, Fabletics, etc. They call a local area doctor on your behalf. You get an email confirmation confirming you can make the appointment. When you sign up, they ask when are your preferred times that you can make your exam. Once you have confirmed, be sure to show up at least 15 minutes early, because more than likely they'll make you fill out information as a new patient. You have an exam just like any other you had in the past. NOTE: TAKE ADVANTAGE OF ALL THE PAIRS THEY LET YOU TRY ON! I have only worn 2 brands in the past 4 years of wearing contact lenses. Acuvue Dailies and Alcon's Air Optix - Monthly. Unfortunately, the dailies cost more both using insurance and Sightbox. Dailies are $89 month with Sightbox. Luckily Air Optix is the one I prefer, even though it is now being discontinued (Noooo!!). My particular eye doctor let me try on the new Air Optix Hydragel Monthly (which are super comfortable), Dailies Total from the makers of Air Optix (which I hated, I have the worst time taking them out), Acuvue Dailies, and Air Optix Colors. I took home 2-weeks worth of dailies, two 1-month trials in 2 different Air Optix Colors, and my normal Air Optix Hydragel. I went online and uploaded a pdf version of my prescription given to me by my doctor and alerted Sightbox that it was ready. 5-days later I received my first six-month supply of Air Optix Hydragel. I was little peeved because for the first time EVER, I had the same prescription in both eyes. Air Optix are actually really affordable and almost not worth having the subscription with Sightbox. HOWEVER, because my eye doctor wrote on my prescription that she also recommends using colored contacts (tell yours to write it down!) I was able to contact customer support and ask if my second half contact shipment could be switched to the colored contacts instead. They responded the next day that they could and went ahead and made the change on my account! I was so happy, mostly because I can afford paying out-of-pocket for regular Air Optix, but the colored versions come at a steep price. If you aren't aware, Air Optix Colors are actually $86.99 IF you get more than 4 boxes. NOT CHEAP. Now, do I recommend Sightbox? For those that have different prescriptions in each eye. Want colored contacts (cause they are expensive). Use their vision insurance for glasses and don't want to completely pay out of pocket. A good alternative for having a payment plan. Want to give it a try? I have a code so you save $20 on your second month of Sightbox service! I know it works because that's how I decided to try Sightbox in the first place. Let me know in the comments if you have used it before!